Ripstop I - Serrated. The Gerber Ripstop I serrated knife model 22-41613 weighs in at an unbelievably small 2 ounces. Do not let that fool you. 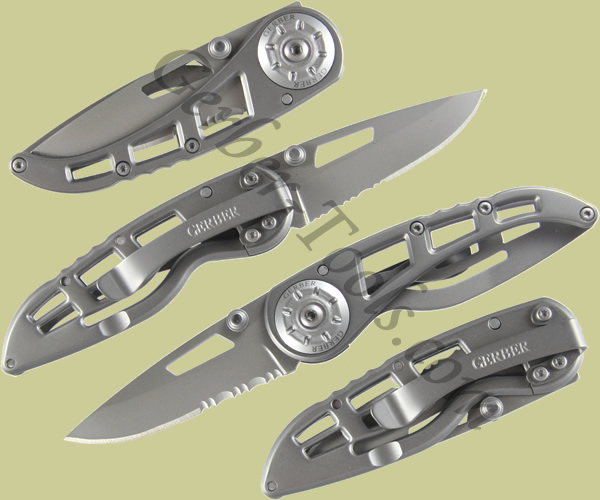 This knife is extremely durable with all stainless steel construction. The mere reason it weighs only 2 ounces is because of the unique air frame design. It features a partially serrated blade for fast cutting, dual thumb studs for easy opening, and a pocket clip for easy access storage.